Someday your going to need a round gasket you don't have, can't buy or don't want to buy. In my case that's always been the N's over-the-counter oil drain plug gasket. An ill fitting total POS and the reason I made this tool. You can make your own for the price of the gasket material. 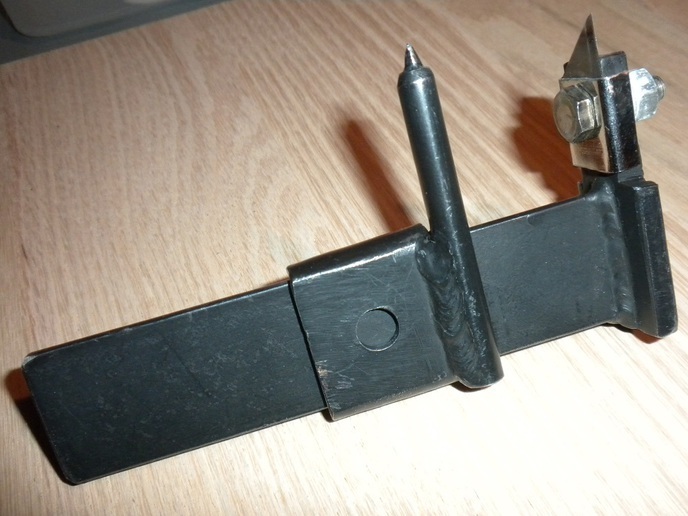 This is 3" X 6", got 1 moving part and was made from scrap riding mower deck pieces and a utility knife blade. I narrowed the blade with a cutoff wheel on a dremel tool and heated the lower part so a hole could be drilled thru it. The rest should be self explanatory. Thanks for the replies and suggestions but I wouldn't trade what I use for anything mentioned here. What I would like to see are some gaskets you posters have made and the cutter you made them with. I saw this a few days ago . I think it would be handy to staple the gasket material to a board as you mentioned . I think I would have difficulty holding the cutter perpendicular for 360 degrees and could use the drill press even if i cranked it around by hand . You made your gaskets look flawless and easy though . My Results May Vary , LOL . 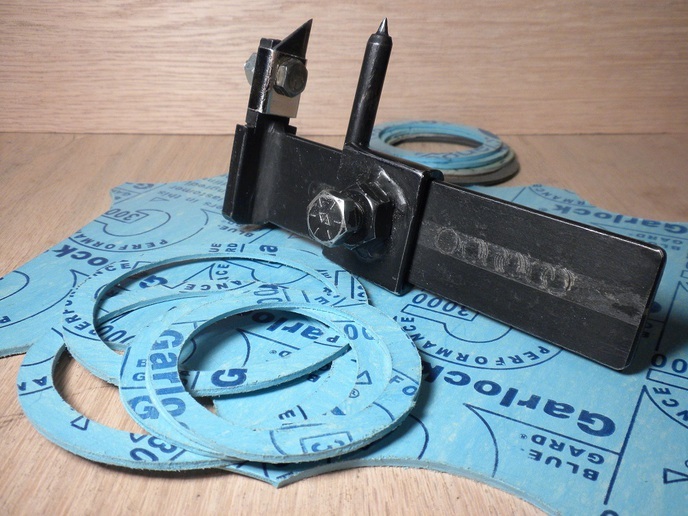 There is a dri-wallers tool made to cut circular holes for light fixtures, that could easily have a knife blade substituted for the cutting wheel. BTDT. Nice work BTW. I learned to make gaskets in the Navy using only a ball peen hammer. I made my share of them too. That's a nice tool. You need something strong to cut through thick material. Nicely done, much nicer than the junk sold in craft stores and heavy enough to even cut through thick leather. Olfa and others make similar circle and rotary cutters, only plastic, which can be found in art and crafts stores. Not nearly as pretty as yours though! Nice work. Has that "made in USA" quality look too. No interest in doing that but you or someone else can. Thanks for sharing Patrick. Have you thought about selling those gaskets?